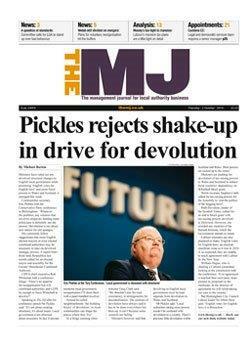 The MJ is a market leading information, intelligence and news resource for anyone who needs to know about the UK’s local authorities. It is published by Hemming Group Ltd, a family owned and privately run company with more than 100 years experience of publishing and event organising for local government. Our subscribers are chief executives, senior managers, elected officials and private sector executives working for, or with, local authorities throughout the UK. We offer unrivalled coverage of local government and public sector matters through our website, the magazine, conferences and events and our data products. 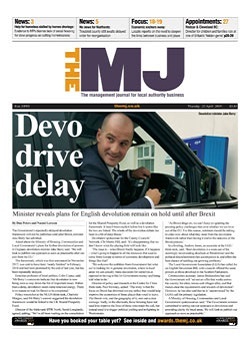 The MJ is the UK’s leading weekly magazine for council chief executives and their teams of decision-makers in local authorities and allied sectors. It offers an insiders’ view of what’s going on and what people are thinking in today’s ever changing and challenging world of local politics – the latest news, incisive comment in-depth features and interviews, business analysis and the top recruitment vacancies. We offer comprehensive news coverage of all the latest breaking stories. Our editorial team is the most experienced in the sector with more than 50 years combined service reporting on local authorities. This means we are able to publish incisive opinion and provide lively comment and debate. Our regular feature pages provide analysis of a wide range of issues that are of direct interest to local government; Whitehall, the Third Sector, Children and Adult Services, Efficiency and Private Sector Business to name but a few. We offer local government staff regular recruitment advice and, of course, carry the industry’s job vacancies. We provide the latest news, analysis, informed opinion and comment on all aspects of UK local government from policy to service delivery. The site offers subscribers comprehensive content created by journalists and commentators who know and understand the industry and the people that make it work. The website is freely available to all MJ subscribers. We organise the annual LGA exhibition and also run our own range of conferences, round table debates and workshops. Once a year we celebrate all that is great about local government at the prestigious MJ Achievement Awards - all of which gives local government senior executives the opportunity to meet, debate with peers, learn and network with key contacts.